Given hundreds of TV-Channels, thousands of Video-on-Demand titles and Apps as well as millions of YouTube videos accessible by today's Internet connected Smart TVs, traditional remote controls are the main barriers for enjoying the content revolution. A natural-language user interface offers the most intuitive and efficient way to access information in large content sources. 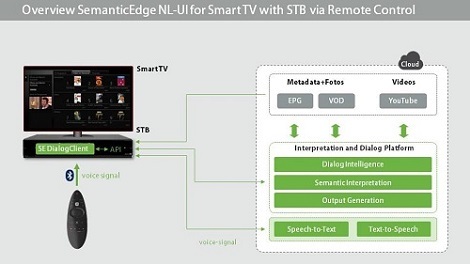 The SemanticEdge Natural-Language Voice User Interface (NL-UI) for Smart TV offers a complete solution for integrating a highly expressive multi-modal user-interface into existing TV and videoplatforms. It consists of two main components: the Interpretation and Dialog Platform and the SE Dialog Client. It provides speech recognition and natural-language interpretation functionality covering the key domains and use cases in Smart TV remote control and media search. 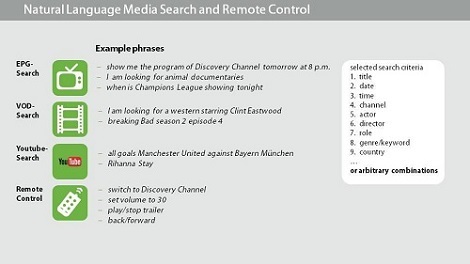 Beyond the pure semantic interpretation it may provide expressive control functionality for the TV monitor in order to adapt the GUI to the natural-language commands and search results. In order to provide these two functionalities the SemanticEdge NL-UI for Smart TV integrates the metadata sources for EPG, VoD and YouTube as well as relevant other user and device information that may affect the remote control or search functionality and the dialog.